(Jhn 20:26-29) And after eight days again his disciples were within, and Thomas with them: then came Jesus, the doors being shut, and stood in the middle, and said, Peace be to you. Then said he to Thomas, Reach here your finger, and behold my hands; and reach here your hand, and thrust it into my side: and be not faithless, but believing. And Thomas answered and said to him, My LORD and my God. Jesus said to him, Thomas, because you have seen me, you have believed: blessed are they that have not seen, and yet have believed. (Jhn 21:16-17) He said to him again the second time, Simon, son of Jonas, love you me? He said to him, Yes, Lord; you know that I love you. He said to him, Feed my sheep. He said to him the third time, Simon, son of Jonas, love you me? Peter was grieved because he said to him the third time, Love you me? And he said to him, Lord, you know all things; you know that I love you. Jesus said to him, Feed my sheep. What these passages recount are some things that the Lord Jesus did and said to His disciples after His resurrection. First, let’s take a look at any differences between the Lord Jesus before and after the resurrection. Was He still the same Lord Jesus of past days? The scripture contains the following line describing the Lord Jesus after the resurrection: “then came Jesus, the doors being shut, and stood in the middle, and said, Peace be to you.” It’s very clear that the Lord Jesus at that time was no longer a flesh, but a spiritual body. This was because He had transcended the limitations of the flesh, and when the door was closed He could still come into the midst of the people and allow them to see Him. This is the greatest difference between the Lord Jesus after the resurrection and the Lord Jesus living in the flesh before the resurrection. Even though there was no difference between the appearance of the spiritual body of that moment and the appearance of the Lord Jesus from before, Jesus in that moment had become a Jesus that felt like a stranger to the people, because He had become a spiritual body after being resurrected from the dead, and compared to His previous flesh, this spiritual body was more puzzling and confusing for people. It also created more distance between the Lord Jesus and the people, and people felt in their hearts that the Lord Jesus in that moment had become more mysterious. These understandings and feelings on the part of the people suddenly brought them back to an age of believing in a God that could not be seen or touched. So, the first thing that the Lord Jesus did after His resurrection was to allow everyone to see Him, to confirm that He exists, and to confirm the fact of His resurrection. In addition, it restored His relationship with the people to the relationship He had with them when He was working in the flesh, and He was the Christ they could see and touch. This way, one outcome is that the people had no doubt that the Lord Jesus had been resurrected from death after being nailed to the cross, and there was no doubt in the Lord Jesus’ work to redeem mankind. And another outcome is that the fact of the Lord Jesus appearing to people after His resurrection and allowing people to see and touch Him firmly secured mankind in the Age of Grace. From this time on, people could not return to the previous age, the Age of Law, because of the Lord Jesus’ “disappearance” or “desertion,” but they would continue forward, following the Lord Jesus’ teachings and the work He had done. Thus, a new phase in the work in the Age of Grace was formally opened up, and the people who had been under the law formally came out from the law from then on, and entered into a new era, with a new beginning. These are the manifold meanings of the Lord Jesus’ appearance to mankind after the resurrection. Since He was a spiritual body, how could people touch Him, and see Him? This has to do with the significance of the Lord Jesus’ appearance to mankind. Did you notice anything in these passages of scripture? Generally spiritual bodies cannot be seen or touched, and after the resurrection the work that the Lord Jesus had taken on had already been completed. So in theory, He had absolutely no need to return to the people’s midst in His original image to meet with them, but the appearance of the Lord Jesus’ spiritual body to people like Thomas made its significance more concrete, and it penetrated more deeply into the people’s hearts. When He came to Thomas, He let doubting Thomas touch His hand, and told him: “reach here your hand, and thrust it into my side: and be not faithless, but believing.” These words, these actions weren’t things that the Lord Jesus wanted to say and do only after He had been resurrected, but they were things He wanted to do before He had been nailed to the cross. It is evident that the Lord Jesus who had not yet been nailed to the cross already had an understanding of people such as Thomas. So what can we see from this? He was still the same Lord Jesus after His resurrection. His essence had not changed. Thomas’ doubts had not just started but had been with him the entire time he had been following the Lord Jesus, but He was the Lord Jesus that had been resurrected from the dead and had returned from the spiritual world with His original image, with His original disposition, and with His understanding of mankind from His time in the flesh, so He went to find Thomas first, to let Thomas touch His rib, to let him not only see His spiritual body after resurrection, but to let him touch and feel the existence of His spiritual body, and completely let go of his doubts. Before the Lord Jesus was nailed to the cross, Thomas always doubted that He is Christ, and could not believe it. His belief in God was established only on the basis of what he could see with his own eyes, what he could touch with his own hands. The Lord Jesus had a good understanding of the faith of this type of person. They only believed in God in heaven, and did not believe at all, and would not accept the One sent by God, or the Christ in the flesh. 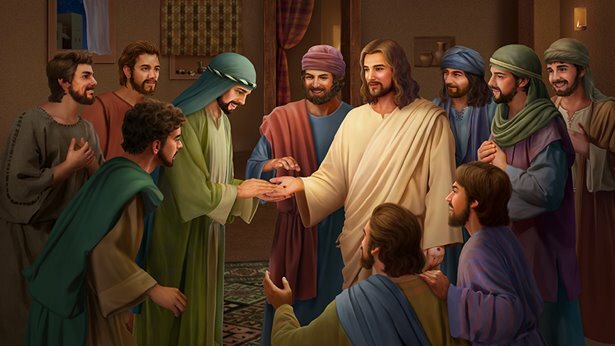 In order to have him acknowledge and believe in the existence of the Lord Jesus and that He truly was God incarnate, He allowed Thomas to reach out his hand and touch His rib. Was Thomas’ doubting any different before and after the Lord Jesus’ resurrection? He was always doubting, and aside from the Lord Jesus’ spiritual body personally appearing to him and allowing Thomas to touch the nail marks on His body, no one could resolve his doubts, and no one could make him let go of them. So, from the time the Lord Jesus allowed him to touch His rib and let him really feel the existence of the nail marks, Thomas’ doubt disappeared, and he truly knew that the Lord Jesus had been resurrected and he acknowledged and believed that the Lord Jesus was the true Christ, that He was God incarnate. Although at this time Thomas no longer doubted, he had lost forever the chance to meet with Christ. He had lost forever the chance to be together with Him, to follow Him, to know Him. He had lost the chance for Christ to perfect him. The Lord Jesus’ appearance and His words provided a conclusion, and a verdict on the faith of those who were full of doubts. He used His actual words and actions to tell the doubters, to tell those who only believed in God in heaven but did not believe in Christ: God did not commend their belief, nor did He commend their following which was full of doubts. The day they fully believed in God and Christ could only be the day that God completed His great work. Of course, that day was also the day that their doubt received a verdict. Their attitude toward Christ determined their fate, and their stubborn doubt meant their faith gained them no results, and their hardness meant their hopes were in vain. Because their belief in God in heaven was fed on illusions, and their doubt toward Christ was actually their true attitude toward God, even though they touched the nail marks on the Lord Jesus’ body, their faith was still useless and their outcome could only be described as beating the wind—in vain. 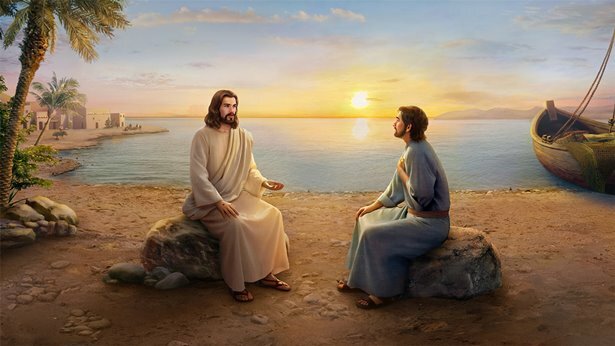 What the Lord Jesus said to Thomas was also very clearly telling every person: The resurrected Lord Jesus is the Lord Jesus that had initially spent thirty-three and a half years working among mankind. Although He had been nailed to the cross and experienced the valley of the shadow of death, and He had experienced resurrection, His every aspect had undergone no changes. Although He now had nail marks on His body, and although He had been resurrected and walked out from the grave, His disposition, His understanding of mankind, and His intentions toward mankind had not changed in the slightest. Also, He was telling people that He had come down off the cross, triumphed over sin, triumphed over hardships, and triumphed over death. The nail marks were just the evidence of His victory over Satan, evidence of being a sin offering to successfully redeem all of mankind. He was telling people that He had already taken on mankind’s sins and He had completed His work of redemption. When He returned to see His disciples, He told them with His appearance: “I’m still alive, I still exist; today I am truly standing in front of you so that you can see and touch Me. I will always be with you.” The Lord Jesus also wanted to use the case of Thomas as a warning for future people: Although you believe in the Lord Jesus, you can neither see nor touch Him, yet you can be blessed by your true faith, and you can see the Lord Jesus through your true faith; this kind of person is blessed. That is the Lord Jesus’ attitude toward those who are full of doubts. So what did the Lord Jesus say to, and what did He do for those who are able to honestly believe in and follow Him? This is what we’re going to look at next, regarding something the Lord Jesus said to Peter. In this conversation, the Lord Jesus repeatedly asked Peter one thing: “Peter, love you me?” This is a higher standard the Lord Jesus required from people like Peter after His resurrection, who truly believe in Christ and strive to love the Lord. This question was a sort of investigation, and a sort of interrogation, but even more, it was a requirement and an expectation of people like Peter. He used this method of questioning so that people would reflect on themselves and look into themselves: What are the Lord Jesus’ requirements for people? Do I love the Lord? Am I a person who loves God? How should I love God? Even though the Lord Jesus only asked this question of Peter, the truth is that in His heart, He wanted to use this opportunity of asking Peter to ask this type of question of more people who seek to love God. It is only that Peter was blessed to act as the representative of this type of person, to receive questioning from the Lord Jesus’ own mouth. Compared to “reach here your hand, and thrust it into my side: and be not faithless, but believing,” which the Lord Jesus said to Thomas after His resurrection, His three times of questioning Peter: “Simon, son of Jonas, love you me?” allow people to better feel the sternness of the Lord Jesus’ attitude, and the urgency He felt during His questioning. As for doubting Thomas with his deceitful nature, the Lord Jesus allowed him to reach out his hand and touch His nail marks, which let him believe that the Lord Jesus was the Son of man resurrected and acknowledge the Lord Jesus’ identity as Christ. And although the Lord Jesus did not sternly rebuke Thomas, nor did He verbally express any clear judgment of him, He let him know that He understood him through practical actions, while also displaying His attitude toward and determination of that type of person. The Lord Jesus’ requirements and expectations of that type of person cannot be seen from what He said. Because people like Thomas simply do not have a thread of true faith. The Lord Jesus’ requirements for them are only in this, but the attitude He revealed toward people like Peter is entirely different. He did not require that Peter reach out his hand and touch His nail marks, nor did He say to Peter: “be not faithless, but believing.” Instead, He repeatedly asked Peter the same question. This was a thought-provoking, meaningful question that can’t help but make every follower of Christ feel remorse, and fear, but also feel the Lord Jesus’ anxious, sorrowful mood. And when they are in great pain and suffering, they are more able to understand the Lord Jesus Christ’s concern and His care; they realize His earnest teaching and strict requirements of pure, honest people. The Lord Jesus’ question allows people to feel that the Lord’s expectations of people revealed in these simple words are not merely to believe in and follow Him, but to achieve having love, loving your Lord, loving your God. This kind of love is caring and obeying. It is humans living for God, dying for God, dedicating everything to God, and expending and giving everything for God. This kind of love is also giving God comfort, allowing Him to enjoy witness, and allowing Him to be at rest. It is mankind’s repayment to God, their responsibility, obligation and duty, and it is a way that mankind must follow for their entire lives. These three questions were a requirement and an exhortation the Lord Jesus made of Peter and all people who would be made perfect. It was these three questions that led and motivated Peter to complete his path in life, and it was the questions at the Lord Jesus’ parting that led Peter to start on his path of being made perfect, that led him, because of his love for the Lord, to care for the Lord’s heart, to obey the Lord, to offer comfort to the Lord, and to offer up his whole life and his whole being because of this love. During the Age of Grace, God’s work was primarily for two types of people. The first was the type of person who believed in and followed Him, who could keep His commandments, who could bear the cross and hold to the way of the Age of Grace. This type of person would gain God’s blessing and enjoy God’s grace. The second type of person was like Peter, someone who would be made perfect. So, after the Lord Jesus was resurrected, He first did these two very meaningful things. One was to Thomas, the other was to Peter. What do these two things represent? Do they represent God’s true intentions of saving mankind? Do they represent God’s sincerity toward mankind? The work He did with Thomas was to warn people not to be doubting, but to just believe. The work He did with Peter was to strengthen the faith of people like Peter, and to make clear requirements of this type of person, to show what goals they should be pursuing. After the Lord Jesus was resurrected, He appeared to the people He thought necessary, spoke with them, and made requirements of them, leaving behind His intentions, and His expectations of people. That is to say, as God incarnate, it doesn’t matter if it was during His time in the flesh, or in the spiritual body after being nailed to the cross and being resurrected—His concern for mankind and requirements of people did not change. He was concerned about these disciples before He was up on the cross; in His heart, He was clear on the state of every single person, He understood every person’s deficiency, and of course His understanding of every person was the same after He had died, resurrected, and become a spiritual body as it was when He was in the flesh. He knew that people weren’t entirely certain of His identity as Christ, but during His time in the flesh He did not make strict demands of people. But after He had been resurrected He appeared to them, and He made them absolutely certain that the Lord Jesus had come from God, that He was God incarnate, and He used the fact of His appearance and His resurrection as the greatest vision and motivation for mankind’s lifelong pursuit. His resurrection from death not only strengthened all those who followed Him, but also thoroughly put His work of the Age of Grace into effect among mankind, and thus the gospel of the Lord Jesus’ salvation in the Age of Grace gradually spread to every corner of humanity. Would you say that the Lord Jesus’ appearance after His resurrection had any significance? If you were Thomas or Peter at that time, and you encountered this one thing in your life that was so meaningful, what kind of impact would it have on you? Would you see this as the best and the greatest vision of your life of believing in God? Would you see this as a driving force of your following God, striving to satisfy Him, and pursuing love of God in your life? Would you expend a lifetime of effort to spread this greatest of visions? Would you make spreading the Lord Jesus’ salvation a commission you accept from God? Even though you have not experienced this, the two cases of Thomas and Peter are already enough for modern people to have a clear understanding of God’s will and of God. It could be said that after God had become flesh, after He personally experienced life among mankind and a human life, and after He saw the depravity of mankind and the situation of human life, God in the flesh more deeply felt the helplessness, the sadness, and the pitifulness of mankind. God gained more compassion for the human condition because of His humanity while living in the flesh, because of His instincts in the flesh. This led Him to have greater concern for His followers. These are probably things that you can’t understand, but I can describe worry and caring of God in the flesh for every one of His followers with this phrase: intense concern. Even though this term comes from human language, and even though it’s a very human phrase, it truly expresses and describes God’s feelings for His followers. As for God’s intense concern for humans, over the course of your experiences you will gradually feel this and get a taste of it. However, this can only be achieved by gradually understanding God’s disposition on the basis of pursuing a change in your own disposition. The appearance of the Lord Jesus materialized His intense concern for His followers in humanity and handed it over to His spiritual body, or you could say His divinity. His appearance allowed people to have another experience and feeling of God’s concern and care while also powerfully proving that God is the One who opens up an age, who develops an age, and He is the One who ends an age. Through His appearance He strengthened the faith of all people, and through His appearance He proved to the world the fact that He is God Himself. This gave His followers eternal confirmation, and through His appearance He also opened up a phase of His work in the new age.